My new years resolution last year was to create. Create happiness, create art, create friendship... just create. Unfortunately last year I didn't stick to that resolution (besides the create friendship, that I rocked out ). My life is almost completely different from this time last year (changed my relationship, home and health to name the major changes) so I don't feel badly about re-adapting this resolution for the 2011 year. The other day, after months of not doing anything art related, I picked up a pencil and I just drew. 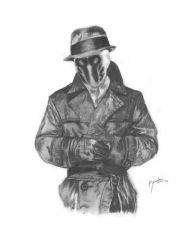 Out popped the Rorschach drawing I have uploaded. It surprised me how well it turned out; and it impassioned me to continue to create. I resolve to make the 2011 year a year filled with creativity. After all, we apparently only have 2 more years left on the earth, better make the most of it. <-- THIS IS THE PICTURE I CHOSE?!??!? Dead on. Looks EXACTLY like you. Where are u baby ?